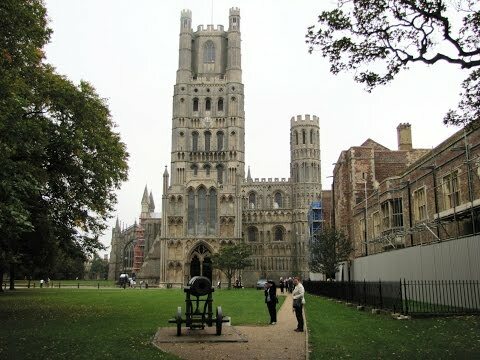 Ely is a Cathedral City in East Cambridgeshire and is the second smallest city in England. Ely is situated on the River Great Ouse and was an important port until the 18th century when the Fens were drained and Ely ceased to be an island surrounded by marshland and water that contained many eels. Ely is said to be named after this abundance of eels which swim over three thousand miles to the Sargasso Sea in the middle of the Atlantic Ocean to breed and the young elvers make their way back to grow and spend several years in the freshwater of the River Great Ouse before returning to the ocean to spawn. Eels are still caught in the River Great Ouse and smoked eel which is a delicacy can be bought at the farmers market and the restaurants often have meals containing eel on their menus. The River Great Ouse weaves on through the flat landscape of East Anglia for 75 miles known as the Fens and has 22 locks. The river with its tributaries, the River Cam, Lark, Little Ouse and Wissey, provides 140 miles of navigable waterway. Boating, barging, canoeing and punting are very popular on the river and in Ely there is a large marina at the area called the Waterside. The University of Cambridge rowing team train on the River Great Ouse for their annual Boat Race against the University of Oxford which takes place on the River Thames but in 1944 the only time the race has taken place on the River Great Ouse the victory went to Oxford. Nearby just along Pegasus Walk is Jubilee Gardens where there is a 3 metre high steel sculpture of an Eel, a rock with water flowing from it, a band stand and ample space to sit, relax and watch the world go by. A little further on from Jubilee Gardens, over Broad Street, is Ely Park where there is an eel hive made from willow, these were used for catching eels. There is much to see and do in Ely with its many historic buildings and narrow winding shopping streets. In the large market square there is an impressive sundial and markets are held every Thursday and Saturday. Ely is home to Oliver Cromwell’s house which was built in the 13th century and he and his family lived there for ten years from 1636. He became MP for Cambridge and had an active part in the draining of the Fens. The house later became a public house and also the vicarage for St. Mary’s Church but today it is a museum, dedicated to Cromwell, and a Tourist Information Centre. Nearby St. Mary’s Church is also of 13th century but the tower and spire were added in the 14th century. Cromwell’s youngest daughter was christened in this church and on the outside south wall there is a memorial plaque to five men executed for their part in the Littleport famine riots of 1816. Ely Cathedral is one of England’s architectural treasures and the building of this beautiful Cathedral began in 1081 and took 30 years to complete, Oliver Cromwell closed the cathedral during the English Civil War. We park in a side street and make our way to Oliver Cromwell’s House which is also a Tourist Information Centre. Our walk is a combination of The Eel Trail and The Ely River Walk which we picked up in the Tourist Information Centre. We start our walk from here on the Eel Trail. From Cromwell’s House we turn right and take a look round St. Mary’s Church then we turn right again towards the Cathedral passing St. Mary’s Cottage. We then observe and pass the cannon in the grounds of the Cathedral. At the entrance to the Cathedral we turn right down the street called The Gallery. We pass the Bishops House and come to Ely Porta on the left which is a large arched gateway in the wall. We pass through this and take the first path on the left against the wall to have a look at Prior Crauden’s Chapel and The Queen’s Hall. We then retrace our steps back to the gate and take the next left turn to the Cathedral. We walk on the path round the side and back of the Cathedral and then go through Steeple Gate on the right. We cross straight over High Street and head forward to Market Street. At Market Street we turn right to the Market Place where there is a sundial then we carry on forward down Fore Hill to Waterside and the River Great Ouse. We turn left in front of the bridge crossing the river and follow the river path with the river on our right this is now part of The Ely River Walk. When we come to a tarmac lane we turn right and take the path on the left in front of a building. We soon arrive at Cockoo Bridge with Roswell Pits, a Site of Special Scientific Interest, on the left where wildlife can be seen such as great crested grebe, kingfishers and birds of prey. We now about turn and retrace our steps back to the bridge crossing the river at Waterside. At the bridge we head forward with the river on our left along Pegasus Walk then turn right into Jubilee Gardens where there is the sculpture of an eel. At the end of the gardens we cross straight over a main road, Broad Street, into Ely Park where there is an eel hive. We carry on forward until we arrive back at Ely Porta, turn right back along The Gallery, left at the Cathedral and make our way back to our car. The map below is only a rough guide so please pick up the leaflets, costing 40p, from the Tourist Information Centre as stated at the beginning of the walk. This is an easy flat walk round Ely town and by the River Great Ouse. This is a short walk using the maps “The Eel Trail” and “Ely River Walk” we bought in the Tourist Information Centre. Map for this area is OS map 226. From the A1 take junction 14 onto the A14 then take junction 23 onto the A141 which bypasses Huntingdon centre then take the A1123 to St Ives carry on the A1123 until you come to a roundabout take the first exit the A10. Follow the A10 for Ely then follow the signs for the centre and car parks. There is road side parking down side streets. There are public toilets in the coach and car park. For refreshments there are plenty of pubs, cafes and shops.